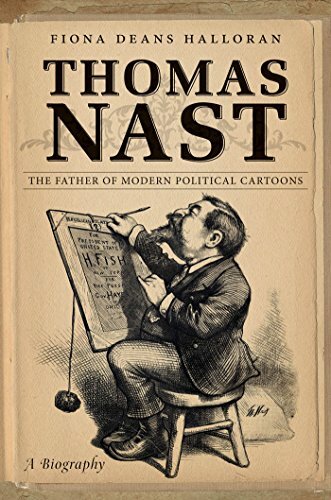 [PDF] Thomas Nast: The Father of Modern Political Cartoons | Free eBooks Download - EBOOKEE! Posted on 2017-12-16, by luongquocchinh. Description: Thomas Nast (1840-1902), the founding father of American political cartooning, is perhaps best known for his cartoons portraying political parties as the Democratic donkey and the Republican elephant. Nast's legacy also includes a trove of other political cartoons, his successful attack on the machine politics of Tammany Hall in 1871, and his wildly popular illustrations of Santa Claus for "Harper's Weekly" magazine. Throughout his career, his drawings provided a pointed critique that forced readers to confront the contradictions around them. In this thoroughgoing and lively biography, Fiona Deans Halloran focuses not just on Nast's political cartoons for "Harper's" but also on his place within the complexities of Gilded Age politics and highlights the many contradictions in his own life: he was an immigrant who attacked immigrant communities, a supporter of civil rights who portrayed black men as foolish children in need of guidance, and an enemy of corruption and hypocrisy who idolized Ulysses S. Grant. He was a man with powerful friends, including Mark Twain, and powerful enemies, including William M. "Boss" Tweed. Halloran interprets Nast's work, explores his motivations and ideals, and illuminates Nast's lasting legacy on American political culture. No comments for "[PDF] Thomas Nast: The Father of Modern Political Cartoons".